It was such a nice Spring day on Friday that I had to leave the confines of my desk and spet a few moments in the sun. After lunch I walked a short loop in South Mountain Reservation entering from the Locust Grove parking area with the intention on checking into what wildflowers were appearing. Here’s what I spotted. 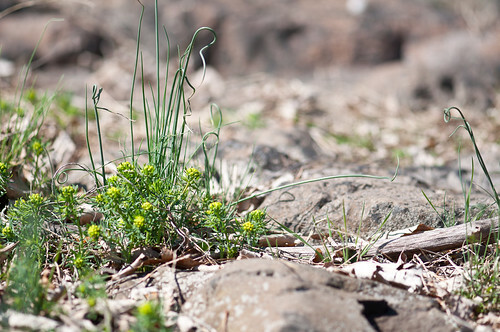 What signs of Spring have you seen on the trail? 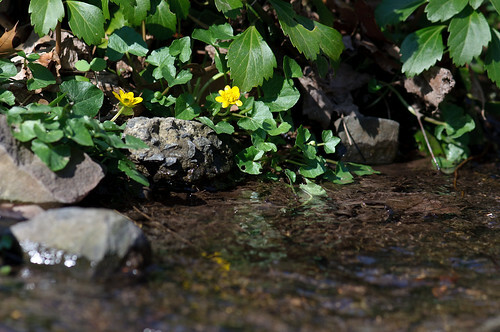 This waxy yellow flower can be seen in many spots in the valley near the water, runoff or muddy areas. The above photo was taken right off the parking area. Wikipedia entry for Lesser celadine. 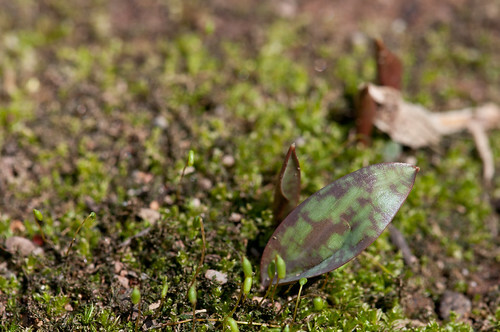 Trout lilies are my favorite spring wildflower to photograph. On this walk I didn’t see any of the yellow flowers blooming yet, but the familiar leaves were popping up out of the moss all around the park. Lady Bird Johnson Wildflower Center page on Trout Liliy. Not quite at peak yet, the cypress spurge in the exposed rocky basalt areas near the top of Washington Rock has begun making an appearance. Wikipedia entry for Cypress Spurge. 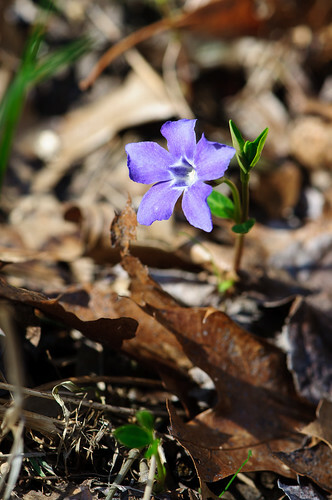 The crocus have died back, but there’s still some purple to be found in the viney Periwinkle flower. Periwinkle info at USDA Plants. I’m the last person that would consider myself an export on identification of wildflowers [or trees, or birds or anything else]. I was able to i.d. these spring flowers by three resources — The great reference book Wildflowers ( Northeastern/North-central North America) by Peterson Field Guides, asking for help of experts on the internets in forums like Flickr’s ID Please group which has 5800 people all helping each other identify things, and repeated sightings. If you’re not sure what you’re looking at wile on a trail, take a photo and then look it up when you get back. File that away for later reference. This entry was posted in Trip Report and tagged Essex County, flowers, photos, plants, south mountain reservation, Spring, wildflowers. Bookmark the permalink.